With thousands of products focused on children, many times we have to trust that those creating those products aren’t misleading us as parents. 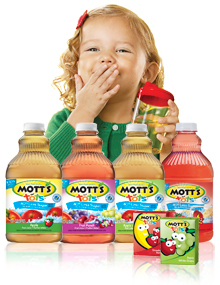 Motts for Tots says it has 40% less sugar than regular apple juice – which, for us parents who have heard that juice isn’t the best drink choice because of sugar content and who also know how much our children love it, seems like a dream come true. Then I read the label. Normal apple juice contains 100% juice (the real ones anyway). This one contains 54% juice. Then I kept reading – the first ingredient is water. Then it dawned on me – this is WATERED down apple juice!! I’m getting 54% of the apple juice I could have gotten for my child because… and here is the news flash… I can ADD WATER MYSELF! Honestly folks, in my opinion this is a rip off. Now I will say that if someone wanted to buy the Motts for Tots in the juice boxes because if you are on the road you don’t want to carry Apple Juice AND water then I could understand it but otherwise I think this is a product taking advantage of parents wanting to do the right thing. I have other ridiculous marketing examples that I will share over the next few months.